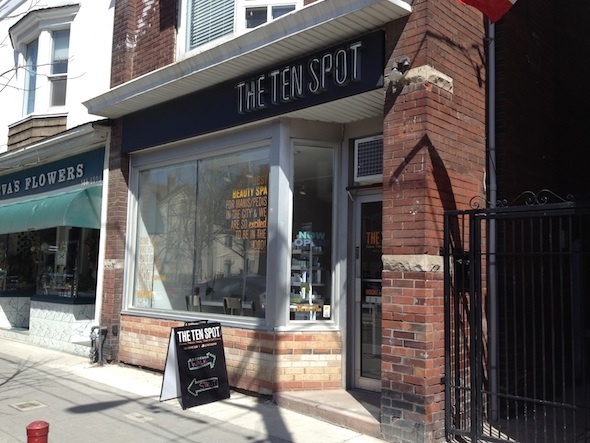 From the first point of contact to the atmosphere of the salon to the actual wax treatment I received, the Ten Spot‘s Queen West location literally scored a perfect 10 for me. Super sweet and helpful staff cheerfully played schedule jenga with me, sans even the slightest air of irritation, despite my 5+ “ooh, that’s not going to work for me”‘s. Finally settling on an appointment time – which I realized after the treatment explained the few windows of available space for my appointment as I’m sure every woman (and man!) in the GTA clamours for a spot – I headed in a few minutes early to scope the scene. I’m really glad I did, because after offering to be shown to the ladies room prior to my appointment (nice touch!) I gleefully discovered the stack of glossy, current magazines while hanging my coat on the generously sized rack (not smushing my coat into a cramped closet only to see it on the floor after my appointment: also a nice touch!) I settled in to a hightop table with the latest edition of ELLE Canada alongside the rows of manicure and pedicure stations; on one wall, a little espresso bar is set up, opposite a wall featuring champion skincare lines Dermalogica and Skinceuticals as well as the latest polish collections, all which are used for facials and mani/pedi services. In addition to facials and mani/pedis, the Ten Spot also (rather famously, meticulously, and believe it, painlessly) offers waxing. 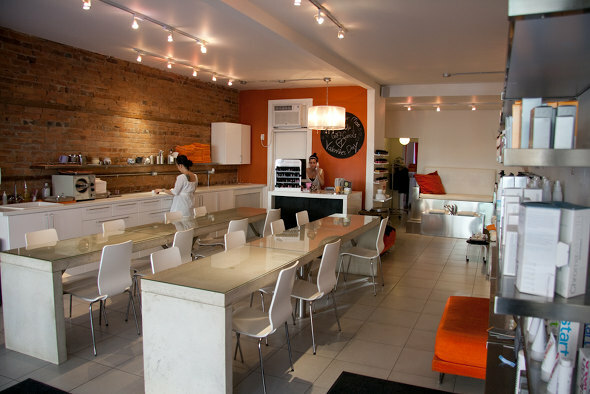 Never have I been to a beauty bar that manages to give each service equal attention and utmost quality of treatments; your mani, voted best in the city, is just as well received as your brazilian wax (or “Brazilly”, as its referred to at the cheeky Ten Spot). Both hard and strip wax are used during the treatment, with the exceptionally skilled aesthetician using her best judgement call where to use which formula. Jamie, with who I received what I can honestly say was the best brazillian in my life (included those received in Brazil!) used both for me. I was immediately at ease with Jamie, partly because the comfort and familiarity of Friends was playing on a flatscreen, conveniently suspended at eye level from where you lay on the table. But it was a super relaxed and – dare I say – enjoyable experience altogether as Jamie expertly explained what she was doing. Chatting about the details of the wax (temperature, the difference between the formulas, etc.) was informative and her knowledge really impressed me knowing I was in such good hands; as a beauty junkie, I couldn’t get enough of her expertise and she gladly answered all my questions. Also chatting about funny stuff, like her high school past experience with thongs, literally made me burst out laughing, which is quite a feat if you’ve ever gotten a brazillian and know the position I was in. After the treatment, which I swear was practically painless (I honestly don’t know how she did it!) I was given a sample of a product Jamie mentioned I might like to take home and try. The friendly front desk staff informed me you get five bucks off your next wax if you come back within four weeks, which I will definitely be back for. Thanks a million and see you soon, Ten Spot! Awesome post, I love this place!